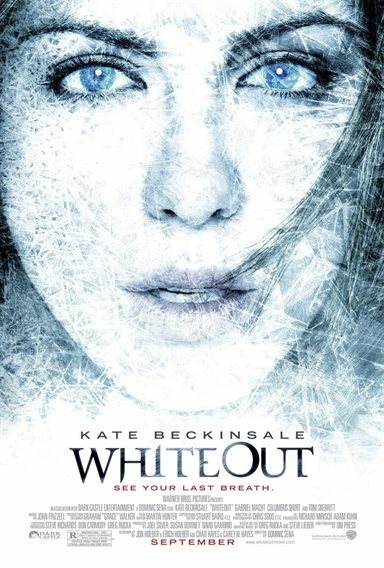 Download Whiteout in Digital HD from the iTunes store. Whiteout images are © Dark Castle Entertainment. All Rights Reserved. One of the biggest problems facing moviemakers, or really, any working artist seeing a project through, is being too close to your project. Often times it takes an objective eye and a kind word to show you that you've gone off the rails and need to correct your trajectory. Once you're in production, things really start humming and you're just running to keep up. You don't have time to do what you need to do, like taking a big step back every once in a while to make sure things still make sense in the big picture. The Hollywood system feeds into this problem by pushing things even faster then they already go, giving people even less time to breathe. Plus, if you get any notoriety you begin to gather around you a cloud of "yes men" who constantly tell you that you spin gold every time you speak. I'm sure one or both of these happened to Whiteout, because I refuse to believe that a film can be worked on for over two years and still come out with as many problems as this film does without one of these things happening to it. The story starts with a Russian plane flying over Antarctica in 1957 (the Russians are swigging vodka as Russians tend to do). An ill-advised gunfight breaks out and the plane crashes into the snowy tundra with all the CG believability of a videogame. 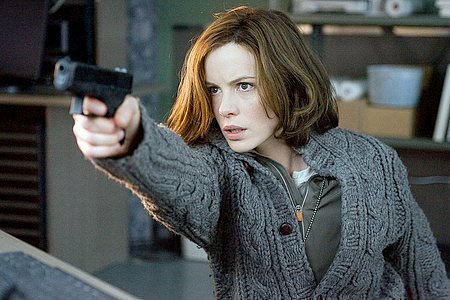 Jump to present day, still in Antarctica, on a science base where we meet, US Marshall Claire Stetko (Kate Beckinsale sporting a decent American accent) and by meet I mean we see her strip down to white bra and knickers then take a long steamy shower. I wonder if the director had the foresight to be clever enough to include this scene, besides for the obvious visual kick, but also for the Alien reference since Tom Skerritt is also in this film. He plays Doc, resident physician to the occupants of this base who do….who knows what. There was a brief, out of the way scene with people studying ice cores – and here's where the heartache begins. The film is full of these small plot threads that go absolutely nowhere. A body is found and Doc and Claire are sent CSI: South Pole style to process the crime scene (snow and more snow) and recover the body found in the middle of…well, since THEY are in the middle of nowhere, the body is in the middle of the middle of nowhere. The sight of the body sparks off a litany of flashbacks in Claire's head. These flashbacks tell us why Claire decided to take this position in the wastelands, plus they show us that one of the screenwriters was trying to be clever in foreshadowing how the story ends. Pay attention and you can walk out halfway through the film. Investigating this homicide takes Claire and Doc to a Russian base where things get really….off. Off in pacing, off in editing, off in storylines and plots. Where's the intervention so desperately needed? There's not much else to say about the story. People start chasing a "McGuffin" that was discovered on the plane that opened the film, there's a masked murderer who has no coherent reason for doing what he does, and things just spiral out irrationally. The other main character in the film is the cold and the snow. Cold that freezes fingers within seconds of exposure, but apparently mouths and noses that are constantly exposed to the frigidness are immune. Doc takes a good ten minutes explaining to some freezing guys what a whiteout is and that "Mother Nature never intended us to survive here." Do you think that this information will come in handy later in the film? A storm is slowly approaching the base. We see this on transparent glass wall-like monitors set up in the middle of the room like they had on Star Wars. Do we have this technology now? If so, what's the use of it in Antarctica of all places? The storm becomes a ticking clock because the base now has to be evacuated otherwise they will be stuck there for another six months. But what about the masked murderer? But what about the McGuffin? But what about making people care what's going on? All of this is blown away to the uncaring wind, like so much lint in a snowstorm. Whiteout images © Dark Castle Entertainment. All Rights Reserved.